The still surface of the water. For more loveliness, please visit: Skywatch. 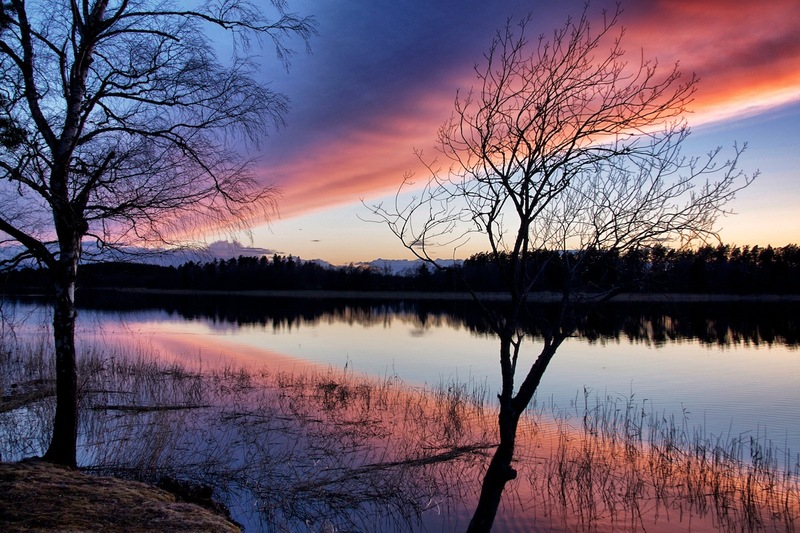 Posted in photography, poetryTagged beauty, crimson, lake, Lake Vallentuna, reflections, ribbons, serene, Skywatch, sunsetBookmark the permalink. “They blush as they kiss…” Gorgeous line. cool…the lines in the sky and reflection create an amazing effect….like a slice of blue sky through the middle….very cool series…. This is another masterpiece of yours. I don’t remember how many times I sighed in admiration and contentment. Breathtaking reflections. You capture the beauty around you so well and we are all the better for you sharing it with us. Your words are always just as beautiful. Gorgeous, breathtaking skies and the perfect words to match, as always! Thanks for sharing the beauty! And what a great way to start my day!! Hope you have a lovely weekend! Enjoy! 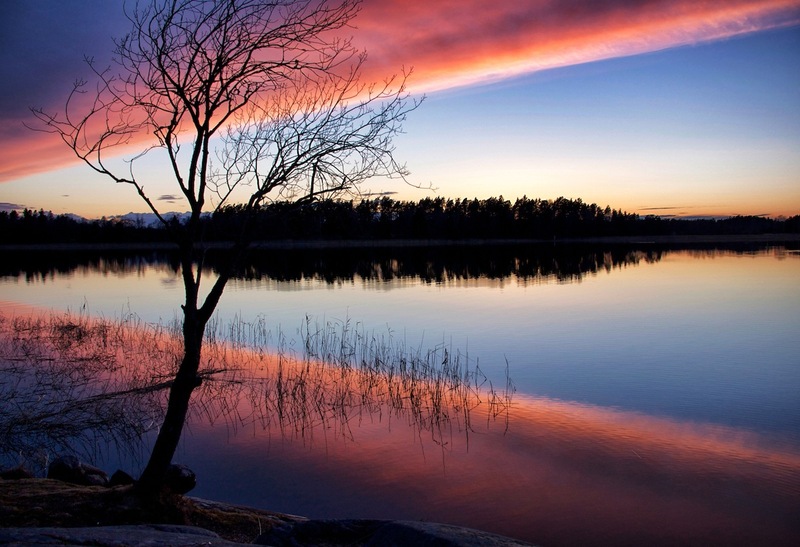 I love your sky ribbons, especially when they are reflected in the lake!!! I see a lot of sunsets in both my real and virtual life. But few are as lovely as yours and none are as beautifully described. What a perfect title for these gorgeous photographs. Incredible shots! And I just love how you described the sunset – perfection! My God! Those take my breath away! Simply gorgeous! Beyond gorgeous! A religious experience! Wow! Gorgeous sky and reflections! So beautiful! The trees and you share a fabulous view! Wonderful photos are gorgeous such beautiful colors! Greetings. Wow! Gorgeous colors and reflections! Thanks for sharing your beautiful skies! Wow.. I could practically fall into these scenes. Gorgeous! I have to copy what “Stardust” says,- This is another masterpiece of yours….. Breathtaking!! Thank you for capturing this for us! Stunning double ribbons of the setting sun. Your composition is brilliant in these photos Fi. Those scenes are fantastic! So glad I stopped by today to see these. Have a great evening. Wow, those are beautiful ribbons! What lovely images you were able to capture! The lake is melting, the lake is melting….stunning. 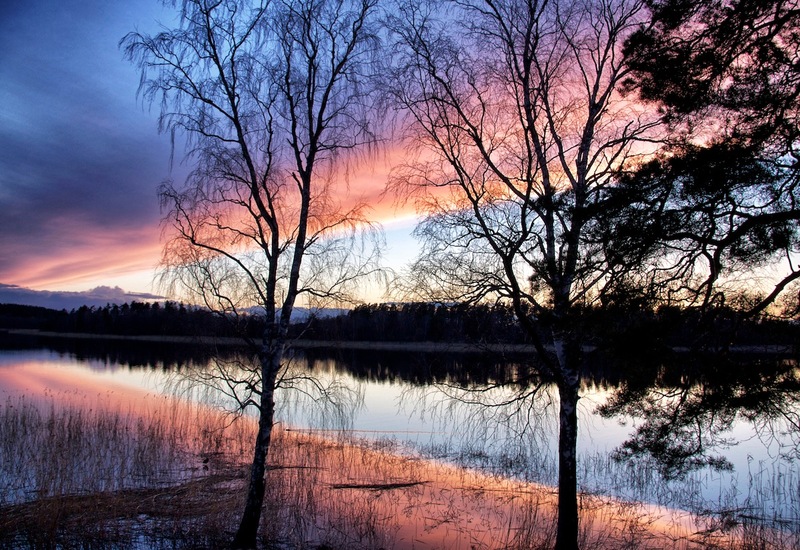 These are absolutely gorgeous — both the sky and the reflections. Spectacular! Have a wonderful weekend, Lady Fi! Wonderful skies and reflections!! Excellent photos. Ribbons in the sky is a good way to describe that sky… Fabulous!!!! AND the reflection really made it even better. WOW!!! I want to ride a camel! Oh my. Simply, perfectly beautiful. Thank you. What amazing photos. They are the kind of photos that you want to enlarge and mat so you can hang them. Oh my ! What a splendid composition of colors ! Rarely do I see such a perfect sky with contrasting colors. You captured it well! Thanks for visiting! The colours in these shots are fantastic, lovely images. I also like the images of your dog above the post. Beautiful. Have a nice weekend. I aspire to inspire as You do! Stunning….loved the colors and composition. Utsøkte bilder … og for en himmel! Fantastiske farger og vakker speiling. Such vibrant colours – if you painted that scene, no-one would believe it! So beautiful colours! So lovely! Just can say WOW! I realize, I missed that lake over the winter. 🙂 Beautiful. These are stunning shots. I love the ribbons of color. Your narrative is always so good too. Now that ribbon is a catch. Beautiful! What a perfect image for SWF! Absolutely gorgeous, what a sunset! We shared the same awe at similar sunsets, though no two are ever the same, from different parts of the world. Absolutely stunning, real works of art! Fantastic and magical views indeed! Super wow! Incredible and stunning sky photos! Love, love the colors! How do you do it? 🙂 Marvellous shots. Many thanks. Excellent photos. The color of the sky and its reflection on the water are awesome. Wonderful calmness, the flat water. Michelangelo himself couldn’t replicate that…wow. A rare, spectacular and doubly magical shot! Thank you for capturing and sharing this beauty. Wow vilka bilder! They are super! Top job!! I can´t imagine the feeling of seeing this in person… HOW BEATIFUL!!! These should be framed on a wall; gorgeous! Lady Fi, you never fail to bless my day with beauty. Thank you!! You do capture the most amazing colors in the sky! Simply gorgeous. Thanks for stopping by at my sky.